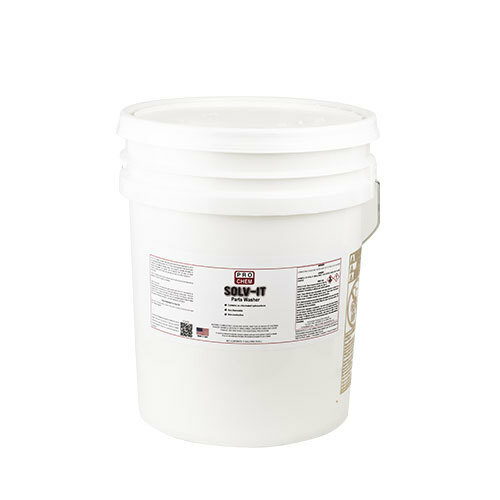 Solv-It | Pro Chem, Inc.
SOLV-IT is a highly versatile, high flash point, solvent-based degreaser for all of your specialized cleaning needs. It has a low evaporation rate that ensures continuous and effective cleaning power. This product is specially formulated to remove accumulated soil, grease and oil deposits from all types of metal. Great for cutting carbonized soils and will not flash rust when applied to bare metal. Use with our Sure Shot sprayer for easy, convenient application. SOLV-IT is ready to use and can be brushed on, wiped on, mopped on or sprayed on. Choose application appropriate for job. When using refillable steel sprayers, follow directions from sprayer manufacturer. PARTS WASHER: Fill the reservoir of an approved parts washer with SOLV-IT. Use washer as directed by the manufacturer to clean and degrease metal parts. Remove excess SOLV-IT using a soft cloth or allow to air dry. If air-drying, note that SOLV-IT is designed to evaporate over an extended period of time to allow for maximum corrosion prevention. Use with adequate ventilation.